Limiting your sugar intake will not only help you keep your weight steady, but is essential for good health. Sugar has been implemented in obesity and likely contributes to heart disease and cancer, according to Dr. Robert Lustig, who famously calls sugar "poison" in his lectures. Spaghetti squash, a vegetable with the unusual appearance of thin noodles, is low in sugar. That can help you reduce the overall amount of sugar in your diet. Eat a pile of spaghetti squash and you will consume far fewer calories than you would if you had loaded your plate with actual spaghetti. Like other squashes, spaghetti squash is low in calories. A cup of this squash provides only 42 calories, compared with spaghetti's 221 calories per cup. Spaghetti squash, since it is so low in calories, works well with many low-carb diets, since it provides only 10 g of carbohydrates per cup, 2 g of which are from fiber. This squash also provides 1 g of protein and a trace of fat. When you're trying to cut down on sugar, it's always a good idea to know the sugar content of every food you eat, since it can add up. Spaghetti squash won't derail a primarily sugar-free diet. A one-cup serving provides only 4 g of sugar, which will be absorbed slowly into the bloodstream because of the fiber in the squash. Other varieties of winter squash can have twice the carbohydrates and sugars as spaghetti squash. This isn't necessarily a bad thing, however, since the sugars in pumpkin, another winter squash, show promise in helping to lower blood sugar, according to researchers at the College of Food Science and Nutrition Engineering in Beijing, China. It is possible that other winter squashes have the same effect. If so, eating spaghetti squash could help you to control your insulin production. Many people increase the sugar content of spaghetti squash without even realizing it. 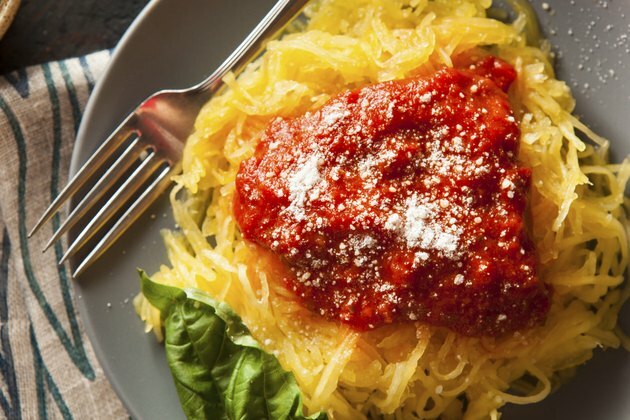 Spaghetti squash often is topped with sugary pasta sauce, which can have more than 11 g of sugar per half-cup serving. Look for brands that have 3 g of sugar or fewer per serving, or make your own sauce from fresh tomatoes. Top a serving of spaghetti squash with a sprinkling of herbs and olive oil for a sugar-free topping. When you replace actual spaghetti with spaghetti squash, not only are you saving a significant number of calories, but you will help your blood sugar levels to stay on an even keel. When you eat refined carbohydrates, your body turns them into glucose -- a form of sugar -- much faster than when you eat complex carbohydrates such as squash. Using spaghetti squash as a side dish in place of potatoes, rice or other high-glycemic foods that negatively affect blood sugar also is a nutritious choice.